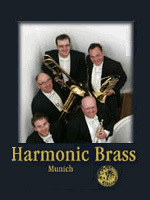 For 4 trumpets (1st is either Bb or piccolo), 2 horns, 3 trombones, euphonium & tuba. 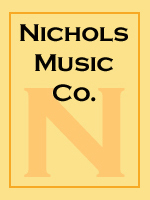 Recorded by Boulder Brass on their CD, "A Visit from Saint Nick." Baroque. Transcription of a work originally for organ, here for 11 brass. In the original key. Trumpet 1 is Bb piccolo. Trumpet 2 is Eb. Trumpet 4 is flugelhorn. Trombone 3 is bass trombone. Score & parts. 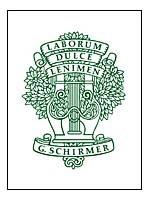 Recorded by Boulder Brass on their CD, "Bolder Baroque." Baroque. Transcription of the third movement (Allegro) from the 3rd Brandenburg Concerto, BWV 1048. Trumpet 1 is Eb trumpet, trumpets 3 & 4 are both flugelhorns. Baroque. Transcription of the first movement of Brandenburg Concerto No 6, BWV 1051. Trumpet 1 is Eb trumpet, trumpets 3 & 4 are flugelhorns. Baroque. From the keyboard realization by Busoni. trumpet 1 in Eb. Trumpet 2 is Bb doubling piccolo. Trumpet 4 doubles flugelhorn. Baroque. 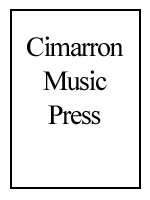 Five movement compilation derived from the English and French Keyboard Suites. 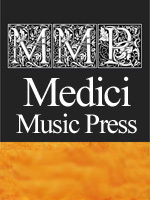 Includes Prelude from English Suite No 3; Allemande from French Suite No 4; Gavotte from French Suite No 5; Sarabande from English Suite No 6; Gigue from French SuiteNo 5. Boulder Brass series. Score & parts. Baroque period. Based on a Theme by Legrenzi. 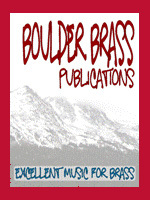 Recorded by Boulder Brass on their CD, "Bolder Baroque." Score & parts. Baroque period. Extract from the Christmas Oratorio. For 11 part brass ensemble divided into two choirs. Choir 1 is 3 trumpets (in D) with tympani. Choir 2 is 303.11. Score & parts. Baroque. From the Christmas Oratorio. 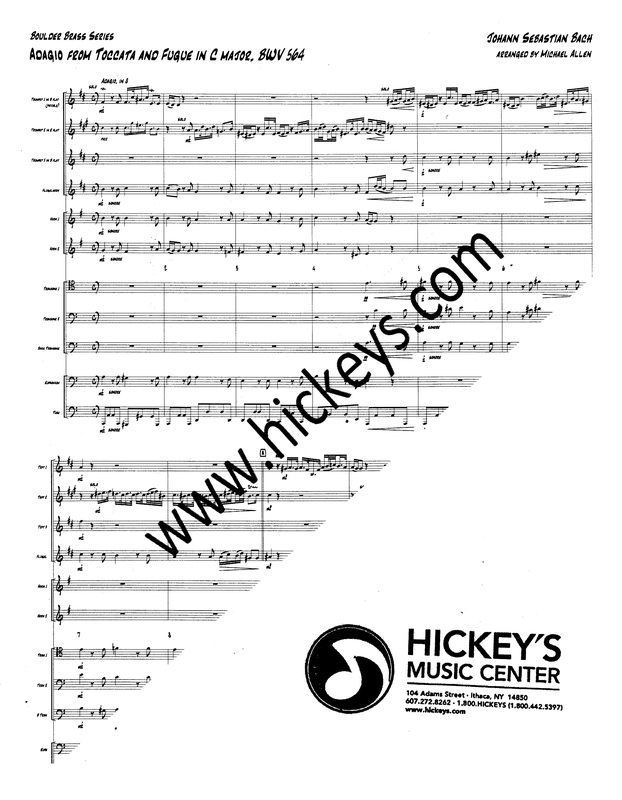 For 4 piccolo trumpets in A, 2 horns, 3 trombones, euphonium & tuba. Baroque. Short Allegretto Simplice movement in 3/8 from the first Brandenburg. Trumpet 1 is Eb, trumpets 3 and 4 are flugelhorns. Baroque. Third movement from Trio Sonata No 6, extracted from Six Trio Sonatas. This work features constant 16th note motion from the opening until the end. Requires good ensemble skills as 16th note patterns are passed back and forth throughout. Score ∂s. Arrangement of Bizet's Farandole, from L'Arlesienne Suite No. 2 by Don Allen. First trumpet plays piccolo or Bb trumpet. Score & parts. 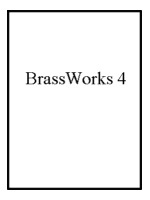 For 343.01 brass and percussion. Percussion consists of tympani, roto-toms, snare drum, tenor drum, bass drum, crash cymbals, suspended cymbal, tam-tam, 5 temple blocks and xylophone. 5 percussionists required. Romantic. Transcripion of the first of the "Edward" Ballades for solo piano, here for 11 part brass ensemble and timpani. In the original key of Dm. Trumpet 1 is Eb. Trumpet 4 is flugelhorn. Trombone 3 is bass trombone. Also known as "Lo How a Rose E'er Blooming," Chorale Prelude No 8, op 122, from Eleven Organ Chorale Preludes. Trumpets are 2 Bb's and 2 flugels. Score & parts. Romantic. Trumpet 1 is E-flat. Trumpet 2 is B-flat doubling piccolo. Trumpet 3 is B-flat. Trumpet 4 is flugelhorn. Romantic. 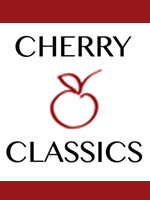 Transcription of popular orchestral work. Trumpets 1 & 2 in Eb, 3 in Bb, 4 is flugelhorn. Trombone 3 is bass trombone. Part of the Boulder Brass series. Romantic. Transcription of the 1869 orchestral work in the original key of F major (the original keyboard version was in A major). Trumpet 1 is Eb. Trumpet 2 is Bb piccolo. Trumpet 4 is flugelhorn. Trombone 3 is bass trombone. Romantic. Transcription of the first movement of the Four Pieces for Piano, op 119, of 1892-93. Adagio. Transcribed to the key of Fm (from Dm). Trumpet 2 double Bb piccolo. Trumpet 3 & 4 are flugelhorn. Trombone 3 is bass trombone. Romantic. Transcription of the second movement of the Four Pieces for Piano, op 119, of 1892-93. Adagio. Transcribed to the key of Cm (from Em). Trumpet 1 in Eb. Trumpet 2 double Bb piccolo. Trumpet 3 & 4 are flugelhorn. Trombone 3 is bass trombone. Romantic. Transcription of the third movement of the Four Pieces for Piano, op 119, of 1892-93. Adagio. Transcribed to the key of F (from C). Trumpet 1 in Eb. Trumpet 2 double Bb piccolo. Trumpet 3 & 4 are flugelhorn. Trombone 3 is bass trombone. Romantic. 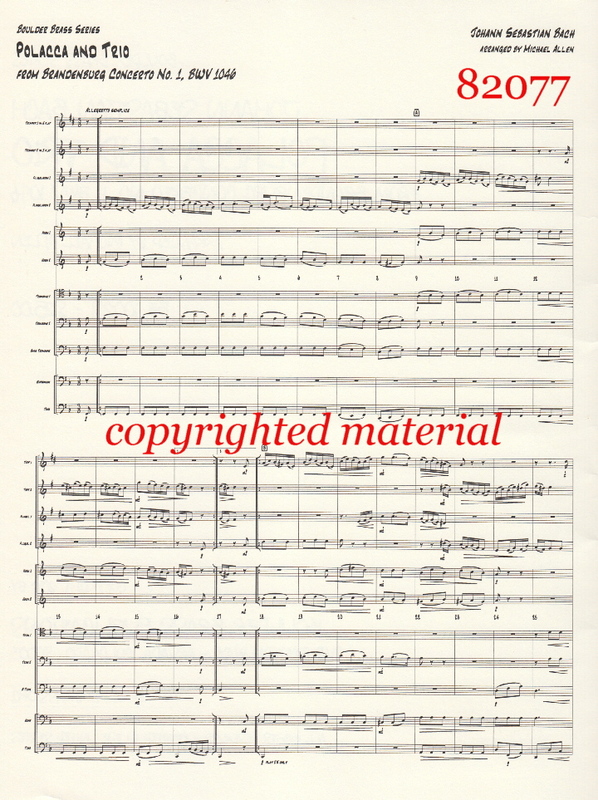 Classic orhestral set here transcribed for large brass ensemble. Trumpet 1 is E-flat. Trumpet 2 is B-flat doubling piccolo. Trumpet 3 is B-flat. Trumpet 4 is flugelhorn. 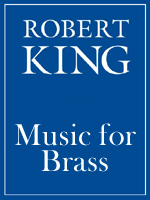 Recorded by Burning River Brass on their CD, "Of Knights and Castles." Baroque. Up-tempo dance movement for large brass choir. Trumpet 1 is in Eb, trumpet 4 is flugelhorn. Boulder Brass series.